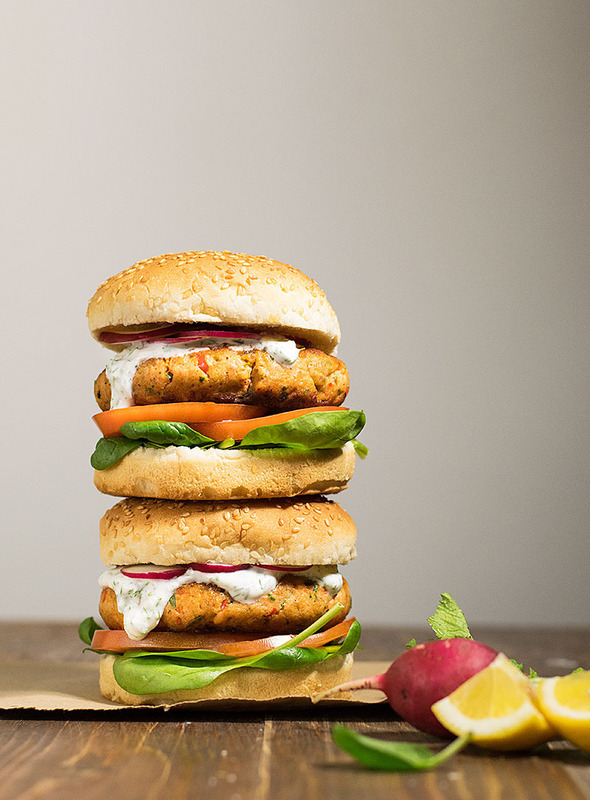 Protein rich and full of flavor healthy salmon burgers! The yogurt, lemon and dill sauce takes this recipe to a whole new level! 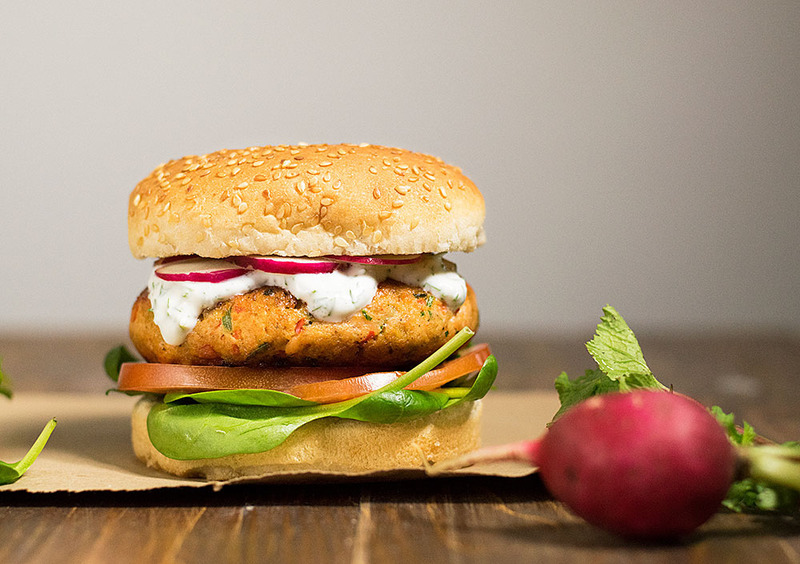 The only reason I don’t make these Mediterranean healthy Salmon Burgers with yogurt & dill sauce more often is that salmon is an expensive fish. But when I saw a nice salmon fillet at the market the other day, I just couldn’t resist its appeal. It had a nice bright, pinkish-orange color and was resting casually on a pile of crushed ice. At that moment it seemed to me that it had a certain amount of cockiness, as if it knew it was one of the best stuff on the counter. I knew I had to make it mine! It was a little more than one pound and I figured that with the skin removed it would be the exact quantity for my recipe. 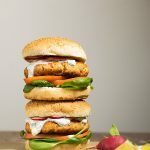 This recipe requires some breadcrumbs and a few vegetables which not only provide additional health benefits but also increase the volume of the finished mixture so that it yields four fairly large fish patties (or six smaller ones). So, with one pound of salmon you can feed four to six people; Not bad, ha? 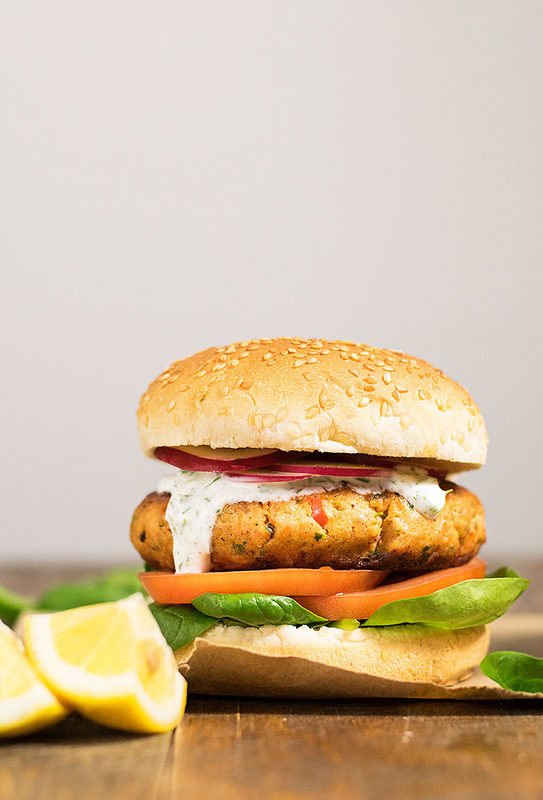 These healthy Mediterranean salmon burgers have a lot more going on besides the juicy salmon patties! Fresh spinach leaves and tomato slices provide freshness while thinly sliced radishes give an extra level of spiciness and some crunch. And then there’s the yogurt, lemon and dill sauce! At first, I was afraid that yogurt and lemon would be an overly sour combination. But that’s not the case at all! It’s like the sourness of the one fights off the sourness of the other, creating a very refreshing sauce which balances the greasiness of the salmon. I must confess I also tried a mayonnaise and capers sauce, but I found the yogurt sauce much better and of course a lot healthier! Every time my mom makes beef patties, instead of oiling her hands, she wets them with some wine, takes handfuls of mixture and forms the patties. If you have some Greek ouzo you can use that to wet your hands, since ouzo pairs very very well with fish and seafood! Just remember to lightly oil your non-stick saucepan before cooking them. Chill your mixture in the fridge for an hour or more. All the flavors will develop better and the mixture will be easier to work with. Don’t overwork the ingredients in the food processor. It’s OK if you can see little bits of vegetables left! This Santorini sweet wine panna cotta is the perfect dessert to help you cleanse your palette! In a food processor, process all the ingredients for the fish patties until a soft mixture is formed. Chill the mixture in the refrigerator for one hour or more (optional). Lightly oil your hands and form 4-6 patties. Cook them under medium heat in a non-stick saucepan, about 3-4 minutes each side, or until browned. In a small bowl mix together the ingredients for the sauce with a fork. 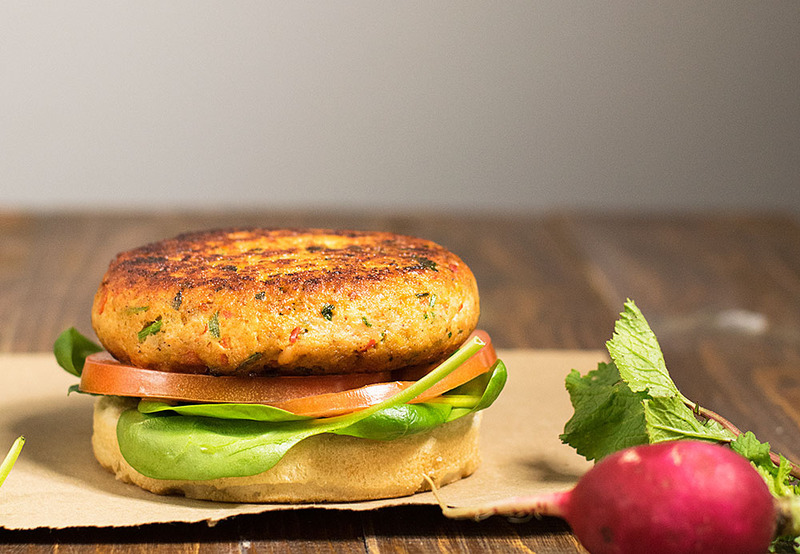 Cut the buns in half, place some spinach and tomato slices on the bottom half, put one patty on top, cover with some sauce, some radish slices and cover with the top half of the bun. 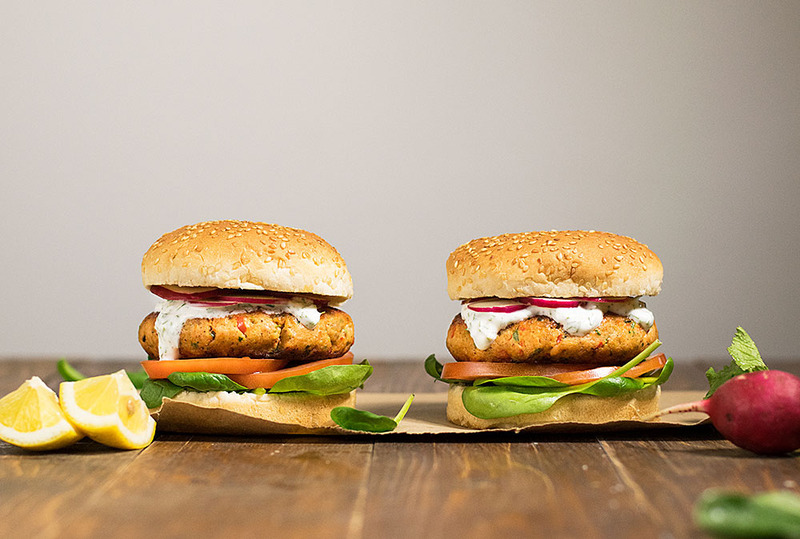 This recipe makes 4 large salmon patties or 6 medium ones. If you have some Greek ouzo you can use that to wet your hands and form the patties. It will give them a great taste! Just remember to lightly oil your non-stick saucepan before cooking them. Don’t lose it, Pin it!